Soda tax revenue is pouring in so much faster than expected that it may not be having the deterrent effect city officials were hoping for. Maybe the tax is just too low for such a wealthy city? When Seattle politicians passed a big tax on soda and other sugary drinks, there was worry at the time that the tax was too big. The majority of the Seattle City Council, though, argued that punitive was part of the point. It’s a sin tax, it’s supposed to hurt. They settled on a 1.75-cents-per-ounce charge that, depending on where you buy your soda, can be up to a 100 percent tax rate (it roughly doubles the price of some bulk soda sold in grocery stores). “For me, the main objective of this whole legislation is about reducing the consumption of this unhealthy product,” Councilmember Mike O’Brien said at the time. Well, we’re a year into the experiment. And in another of those “only in Seattle” developments, it appears that the problem with our soda tax isn’t that it’s too high. It’s probably too low — maybe far too low. The city predicted the tax would cut soda consumption by 40 percent. But through the first nine months, the tax is generating revenues at a rate 52 percent higher than predicted — suggesting it’s possible it may be having no effect on Seattleites’ soda appetites whatsoever. No one knows for certain. It could also be that the city’s baseline estimates were way off. Except there’s also this: The revenue from the tax has grown every quarter so far, which is the opposite of what should happen over time if Seattleites were being scared off sugary drinks due to the new cost. I have a theory. Which is that New Seattle is so rich it can’t be bothered with worrying about puny soda taxes. We’ve seen this already in other areas — most infamously, with the $10 top toll for using the Interstate 405 express lanes on the Eastside. That toll is voluntary, so people predicted only 1-percenters would pay it. But that’s not what happened, with the lanes overflowing even at the top rate. He said it should be at least doubled, to $20 or more, to match who New Seattle really is. Could that be what’s happening with the soda tax, which is also voluntary? That Seattle is such a boomtown it’s now defying the laws of economics? A different economist laughed when I asked him that. “No, but it absolutely could be true that an area of very high incomes might be less responsive to soda taxes, and other taxes designed to influence consumer behavior,” said Benjamin Lockwood, a professor at the Wharton School of Business in Pennsylvania, who has studied how soda taxes change buyer behavior. Lockwood says we need more Seattle data, especially among different income groups. But his research has found that for the “sin” part of soda taxes to work well, the rate should ideally be in the 1.5 cents to 3 cents per ounce range. That puts Seattle’s 1.75 cents per ounce not on the high side, as was thought, but the cheaper end. 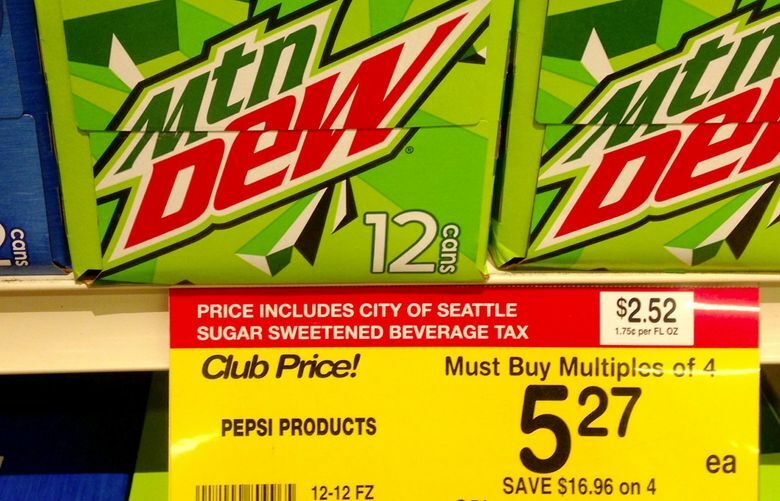 At a Seattle Safeway on Friday, a 12-pack of Mountain Dew was selling for $2.75, plus $2.52 more in city soda tax (for a total of $5.27). At 3 cents per ounce, that tax would rise to $4.32, and the total price to $7.07 — for a 157 percent tax rate! Even that extreme rate might be too low to dissuade gilded Seattleites from buying it. Most of the criticism we’ve heard about the soda tax is that it’s usurious. Labor and the Chamber of Commerce joined to denounce it when it passed, calling it “a destroyer of good jobs” and predicting it would “wreak economic harm” on working families. Some of this may turn out to be happening in slices of the city (researchers at the UW are studying it). But much of the debate at the time seems, in retrospect, nostalgically off. Like we were talking about a middle-class city we thought we still were. Rather than the gentrified one we are. Story of Seattle: Getting so rich so fast we can’t comprehend it.